We have come a long way from the garage in Cupertino, CA which housed our first office and satellite manufacturing lab. From that humble beginning, our team has grown to over 400 employees worldwide, and our days of sitting two-to-a-desk and storing our bikes on conference room walls are well behind us. As we continue our journey toward a Queryable Earth, we are thrilled to unveil our new HQ in downtown San Francisco. It’s Planet’s fourth office and will house our growing team in the years to come. Finding a space that could house tons (by weight) of machinery, hundreds of desks, solve the perennial lack of conference space problem, and manufacture up to 40 satellites a week was no easy feat. After months of searching, we landed on an art-deco building (3x the size of our previous office!) built in 1948 in the heart of San Francisco. Once a booming printing press, the building had been pared down to a simple warehouse that was full of potential. We started with the bare bones, ripping out ceilings, demolishing rotting pipes, and even refurbishing the original boiler, to create the exact space that we needed and wanted. Our team designed Planet’s new HQ with accessibility and inclusion in mind. The space includes all-gender restrooms, a fully equipped mother’s room, and an art gallery – all with the intention of making everyone feel welcome. What a journey this has been! Thank you to our incredible team for working tirelessly to get Planet HQ up and running and for making it home. 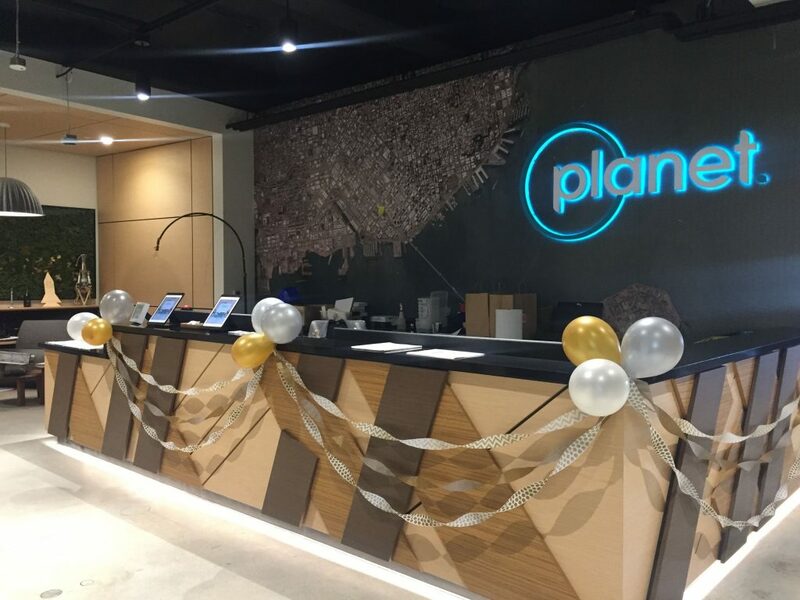 It is satisfying to know that Planet’s next accomplishments – more rocket launches, new customer meetings, and a growing business – will be had in this new space, and we hope that you will follow along as our mission continues. For updates and exciting announcements, follow us on Twitter @planetlabs.